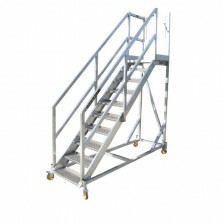 SafeSmart Aviation recognises that access to low level heights over concrete and tarmac can also present fall and injury dangers as much as access to higher heights. When we were commissioned to design and build a suite of platforms and stairs for a client’s new A350 fleet, every access point was considered, including the underside of the aircraft. 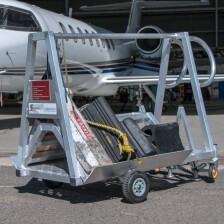 This platform eliminates the use of dangerous ladders, allowing technicians to check oil and perform other checks al around the aircraft quickly and safely, thanks to its sliding guardrails and hand-portability. Excellent for checking avionics, fuselage and any other point on the aircraft.